Summer blog hiatus is over! I was so proud to have the opportunity to make a very special first birthday cake this past weekend. I am one of many bakers across the country who are a part of the Icing Smiles Organization, a non profit organization that provides custom celebration cakes and other treats to families impacted by critical illness of a child. Their goal, excerpted from www.icingsmiles.com is "We understand that the simple things, like a birthday cake, are luxuries to a family battling illness. Our goal is to create a custom cake for the ill child or their sibling that will provide a temporary escape from worry and create a positive memory during a difficult time." These people are tremendous - Icing Smiles matches bakers with families based on location and availability, and really facilitates something wonderful. I also can't say enough about the courage and strength that the family I baked for displays. The celebration was for a little boy celebrating his first birthday, as he battles brain cancer. The cake was perfectly matched to the carnival themed party - the festive decorations and activities the family had planned were so cute!! The whole experience brought tears to my eyes. Stay tuned for more coverage - and I am definitely hoping to post about more "Icing Smiles" in the future! Check out and consider donating to www.icingsmiles.com or "Liking" them on Facebook!! This Saturday, I delivered a henna inspired wedding cake to the Edgmont Country Club in Edgmont, Pennsylvania. This was definitely the most unique wedding cake I have done so far - and I loved it!! The cake was a warm hot pink, with gold fondant appliques to look like henna designs, and gold piping all over the cake in traditional Indian designs. I had so much fun researching the art of henna, and practicing piping with icing much like henna ink is piped onto the body. You could definitely say I got "into the zone" while working on the detailed piping. This was a perfect example of how a wedding cake can really showcase alot of personality and function as a major design element in a wedding. The inside of the cake was a buttery cream cheese pound layered with homemade whipped creme fraiche, fresh sliced strawberries, and covered in cream cheese icing and fondant. Check out more pictures in the Bridal Collection slideshow on the main page. Congratulations Sim and Kurt!! Every parent knows the feeling - it's your child's birthday and you have to entertain a horde of junk food crazed children - and top whatever shindig you threw last year, as well as all of the other parties your son or daughter has recently attended. It's easy when your daughter turns four, and you can hire a Minnie Mouse lookalike, put out some fingerpaints, and serve cookies. Not so easy when the same daughter is now 11, and that in-between age where birthday parties are so crucial in the pre-teen social circles. And when that daughter turns 16 - welcome to what-do-we-do-with-them-all-at-this-party. Cue the Knockout Cakes! touch! 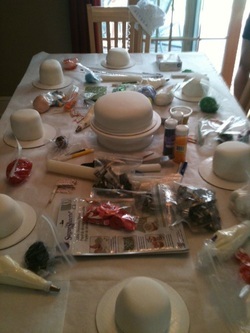 Just last week I packed up all of the most fun cakey materials I have, including tons of different colored fondant, glitter, icing paper, piping bags, molds, and lots of neat little decorations and eight blank canvas cakes. I set up at a sixth grade girl's birthday party, complete with parchment paper table coverings, turntables, rolling pins, and a chef's hat with the birthday girl's name on it. I asked the girls, many of whom have seen Cake Boss, what they knew about cake, who was their favorite character, flavor, etc. and then gave a demo of the materials. Then we got to work - and the girls were totally engrossed for over an hour and a half. We ended up with some really awesome cakes - a Shrek and donkey cave, a soccer cake, a neon flowers cake, an old school Cake Boss-y cake, and more. Then the girls all worked to create a Justin Bieber birthday cake for them to put candles in, sing around, and cut into for the birthday celebration. The little cakes went home with each girl. Included in the service was clean up and take down. Ask me about doing your next party - these could be so much fun for any age. "Mini class" parties with any age group, as a bridesmaids activity, and even cupcake decorating stations at weddings would be fabulous. Another new product from Knockout Cakes is the collage board. Cakes can celebrate a multitude of interests, memories, people, events, etc all in one. Why not make the cake board as interesting as the cake? For example, I just did a cake to celebrate one high school girl's many accomplishments and interests. She loves several different bands and singers, including Taylor Swift, Justin Bieber, My Chemical Romance, the Twilight figures, and more. Rather than put all of that on the cake, I did a zebra print, quilted, rope draped cake in fun colors. Then, I collaged the cake board with pictures of all of these famous people. The best part? The client could then hang up the cake board on her wall as a keepsake display. These cake boards could be so cool for birthdays, graduation (pictures from kindergarten through the years! ), team cakes, anniversary cakes (pictures of the couple) and more. As far as I know, I am the only vendor to offer this!! Consider adding this unique touch to your next order! I thought it was pretty funny that coming off my last blog, what was on Good Morning America this morning? None other than baby gender reveal cakes! Cakes have always been an important part of celebrating life's big events. Wedding cakes, First Communion cakes, birthday cakes - what better (or sweeter) way to showcase someone's special moment. Now, with the party planning industry becoming a billion dollar factor in today's economy, people are thinking of more and more creative elements to incorporate into their parties. Cue the gender reveal cakes. Here's how it works: The expectant couple asks the doctor to write the gender of their baby on a card and seal it in an envelope. The couple then brings the envelope to the baker. Then, the baker creates a cake that is gender neutral and festive on the outside - but either pink or blue tinted icing on the inside. The couple (who do not know the baby's gender) cuts the cake, presumably at a party with their friends and family, and the big announcement is that much sweeter. The link to a previous article ABC did on this new trend is http://abcnews.go.com/Health/wireStory?id=11490457 . Thoughts? A very special morning for one family today - a daughter who lives in California wanted to break the news to her mother that she was having her first baby - and the grandmother's thirteenth granchild - and she enlisted me to help! So, for number 13, I delivered a baker's dozen of 13 cupcakes to the grandmother's door. 8 boy themed cupcakes and 4 girl themed cupcakes - all baby cute and either chocolate or vanilla flavored - and one marble gender neutral cupcake for the new little one on the way made up the batch. The client called her mother as I rang the doorbell, and Surprise!!! I was so touched to be included, and congratulations to Megan, Ellen and the whole family! Big cake week ahead - check back here for the details! Happy Memorial Day, and thank you to all service men and women. You can never be truly thanked enough. Okay - the blog is back. Too many little tidbits to share not to! Check back here every few days for funny stories, cake details, and other information. 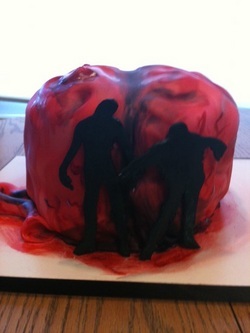 This blog entry was inspired by the zombie cake I created over the weekend. The birthday cake was a tower of chocolate cake, hot fudge filling, and strawberries and sculpted to look like brains, because we know zombies love brains. To round out the zombie theme were two gumpaste plaques cut out in some creepy staggering zombie silhouettes. While I was brainstorming and creating this cake, my mom and brother Dan chimed in with lots of good zombie expertise. 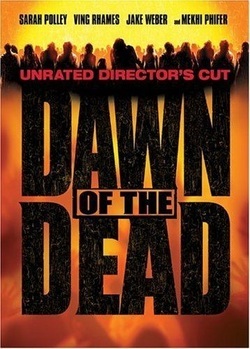 So I consulted them in creating the "Top 10 Best Zombie Films of All Time:"
This was determined after a mini marathon of movies...would you agree with our list? Feel free to add a comment below!! Check back tomorrow for a very special blog. Technology and Cake! Who Knew?! Knockout Cakes! now offers a mailing list for those looking for special savings, new flavor information, event details, and other updates. Email AM655718@wcupa.edu with the subject line "mailing list" to be added. Emails will not be of spam quality or quantity. Also....Knockout Cakes! is now on Twitter!!! 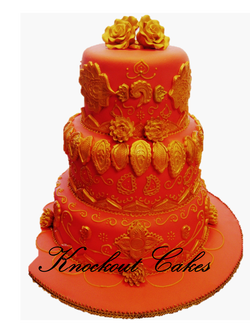 Follow @KnockoutCakes . I will be tweeting during those 3AM caking sessions, the shopping trips when I find the perfect matching cupcake papers, and all the times in between! Bear with me as I navigate the new technology! Finally, we are also on Facebook. Search Knockout Cakes! and become a fan! Hi everyone! Knockout Cakes! will be closed from July 24th through August 7th. I regretfully can not accept any orders during this window but will be back in action on the 8th. Happy Summer! Knockout Cakes! now offers candy buffets! Check out the main page for more information. Also check out the bottom of the main page for new package deals - order things together and receive a discount! This Martha Stewart article and photo gallery are a great feature about candy buffets...check them out! The ideas are endless!